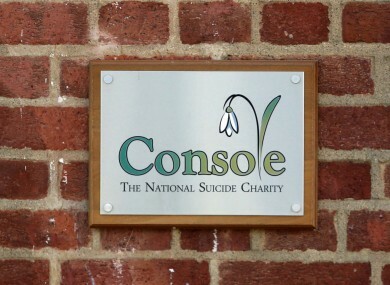 THE DEPARTMENT OF Foreign Affairs (DFA) has sent auditors to examine the UK arm of suicide charity Console. The London-based arm of the suicide charity has received DFA funding of around €150,000 in the last three years. Additionally, RTÉ reports that the UK charities regulators has frozen two bank accounts belonging to the charity, worth almost £44,000 (€51,000). The department confirmed this morning that an audit is underway. The decision was taken after a meeting between the HSE, Department of Health officials, the Charities Regulator, other representatives from the sector and interim chief executive David Hall. The suicide charity has been embattled since it emerged two weeks ago that founder Paul Kelly had used company credit cards on travel, clothes and cash withdrawals. The scale of the alleged wrongdoing has steadily increased over the fortnight, culminating in Hall being granted a court order to break the lock of a storage unit Kelly was seen transferring items into. There are currently 12 full-time staff members and 60 part-time counsellors working at the Kildare-based charity. Email “Department of Foreign Affairs sends auditors to investigate UK arm of Console”. Feedback on “Department of Foreign Affairs sends auditors to investigate UK arm of Console”.